Made in China products are competitive when it comes to quality, cost and productivity. But international trading companies also have to take into account logistics and transportation issues. Among which, shipping cost and transit time are the most important two factors. We have a basic guide to the freight cost in another post. 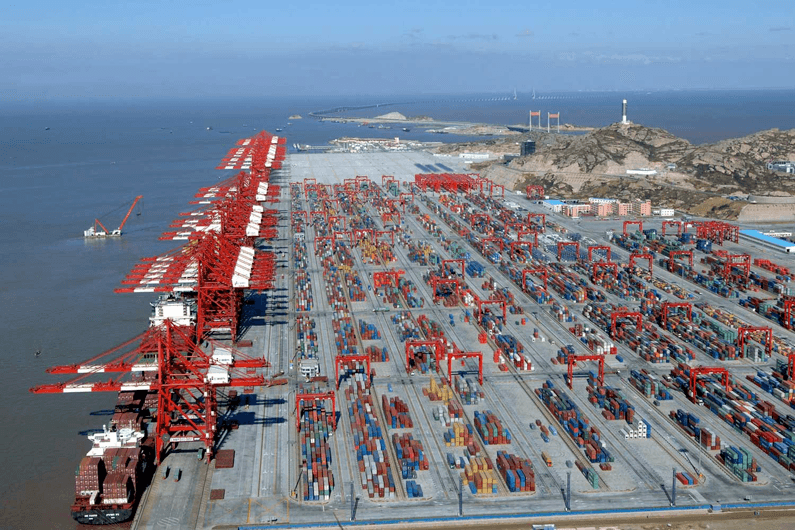 So this post will focus on the other one: How long will your china freight arrive? Delayed deliveries from Chinese suppliers or the carriers may lead to costly loss of sales and customers loyalty. There’s nothing you can do at most cases when your shipment has been taken over by the carrier. So it’s necessary to find the estimated shipping time before you actually choose the carrier and hand over to it. Generally, here are two steps to find the transit time. 2. 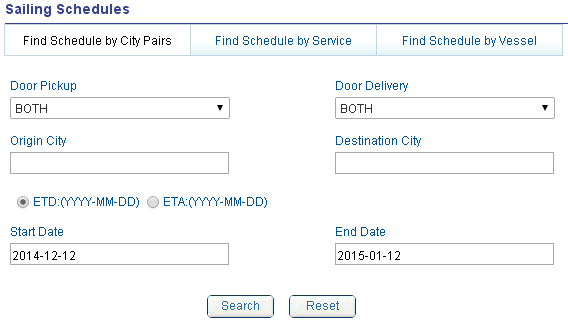 Find the carrier’s route schedule. Luckily, all these can be done online for free. And the information provided by the official website are most accurate based on their years practical experiences. Let’s find out one by one. 1. Though this article is focused on the transit time, we’ll still list the rate calculator link if available, for your easy one-stop reference. 2. There are so many airlines for air cargo shipping from China. If you can leave 10 days for delivery, you’ll never miss it. So the list below will not include the schedule links from the airlines. Courier is the best international shipping method for small items. It’s fast, and more importantly, most of them are providing Door to Door delivery. By this, you can save a lot of time on Customs and other complicated export & import processes. You can choose the expresses directly from China mainland or via Hong Kong. As you may know, the price is cheaper through Hong Kong, but customs there sometimes will check a greater percentage of shipments before allowing them to leave the country, especially for the goods that shipped via DHL, FEDEX, UPS, TNT. Customs clearance delays at Hong Kong port may happen from time to time. While local express company (like Shenzhen FedEx, Guangzhou DHL…), they have directly flight schedule, and these customs will be not so strictly. Make sure take it into consideration when you have a very serious ETA deadline. China Post is second to none when only considering the cost. That’s why most Chinese sellers at AliExpress or similar online stores choose this service, and some sellers even provide worldwide free shipping. But how long? There’s no answer from the authority. The time cost can be vary from 1 weeks to 4 weeks, sometimes even 2 month. And it differs every time. You got your stuff after a month this time doesn’t mean a month is the average time. So prepare for the longest and you’ll be satisfied if i.e. 28 days actually. EMS, Worldwide Express Mail Service, is a brand owned by China Post. It’s faster than regular China Post. And it’s safe, because it has keep managing the delivery of all original University Admission Notice in China every year. Normally it will take about 3~8 days. It’s slower than other international express couriers. After all, a little cheaper. EUB is only available for eBay sellers in China. It’s a faster shipping than regular airmail. But the destination country is only four by now. Below is the estimate time from eBay. Make sure to double check with the seller to get the delivery time. TNT is super fast when it comes to shipping to Europe and Middle East. Some countries can be delivered the next day. Normally 3~5 days. Besides, the price is competitive when it comes to heavy goods. DHL is the most average international courier. Normally 2~5 days, but sometimes unstable. UPS is specialized in America routes, especially North America. Normally 2~6 days. FedEx has the best service, while its price is higher accordingly. Normally 2~4 days (IP) and 4~6days (IE). We have a post sharing our ideas about how to choose a cheaper express courier. You can click here to find more. Below is a list of main carriers for ocean cargo containerized from China to worldwide. Almost all of them can provide a search from port to port. For example. 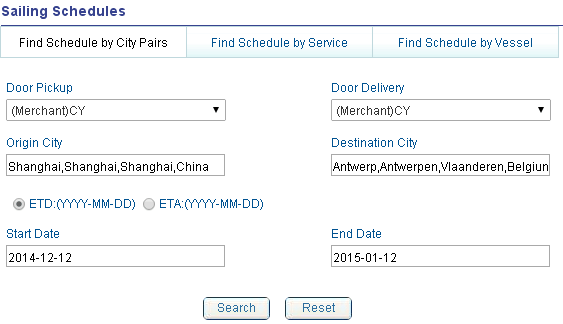 You are a Belgium importers, and your supplier located near Shanghai Port. So Shanghai Port to Antwerp Port. Let’s choose COSCO to give you a step by step guide. 1. Open the sailing schedule link from COSCO. 2. Fill the form as below. 3. After submit, you’ll get the result. Attention: If you are looking for the landed time, which is the total time from your vendor to your facility in your country, make sure plus 7+7 days additionally. After the production done, your supplier will pick up the empty container and load it at the manufacturer or warehouse. And the free container usage is 7 days. Within the 7 days, all the export process has to be done, including inland transport, loading, documentation, customs declaration, and any other handling work. Add another 7 days at the destination. This 7+7 method applied to FCL. If LCL, you will need more days. Conclusion: If you are expected to receive your products in December, you’d better complete all the discussion and prepaid process with your supplier before September. It’s a long time – three month. Leave yourself enough time is a good strategy for saving freight cost. You can do your own calculation after checking the schedule below.